1 – In light of our schedule conversation earlier this week, I sat down and made us a schedule for the school year. I think it is going to be good. So leading up to the school year we are starting to work on some of the habits and skills we need to get in place to be successful with this schedule — like me waking up early and immediately getting my shower and revamping the morning chore list. I also decided to work on a couple of other habits and skills with the kids on a week by week basis. This week they are working on the habit of clearing their spot after meals and two skills: making their own breakfast (beyond cereal) and folding laundry. 3. Speaking of projects, I just want to say thank-you for the overwhelming response to my eBook. You guys have been awesome, and I love that it is blessing so many of you. 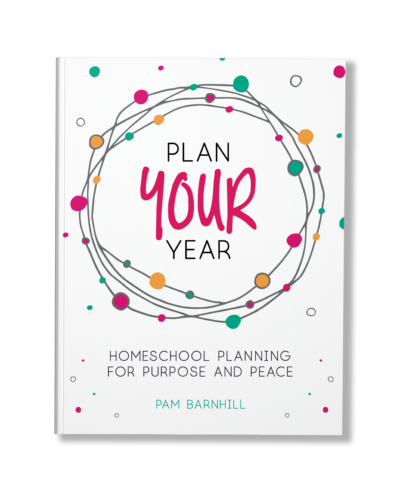 I am going to be chatting with Michele White from Preschoolers and Peace on Monday about the book and homeschool planning. You can see the event page here. If you click “YES” that you are coming G+ will send you reminders about the event and a link to the recording even if you can’t make it. Would love to have you watch. 4. 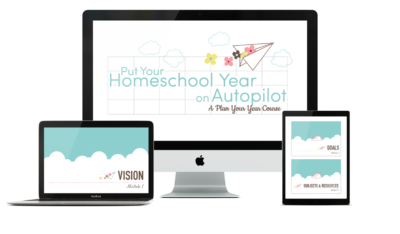 One of my favorite homeschool products is having a sale! 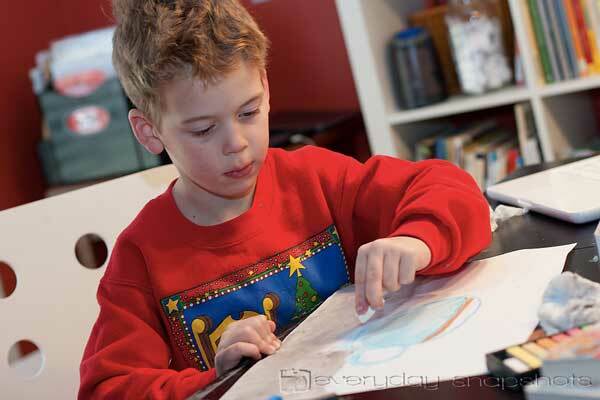 We just love HodgePodge Art’s Chalk Pastel series. You can see one of our projects here. Pastels are so much fun and so forgiving. I was really worried about the mess at first, but Tricia reassured me that some baby wipes go a long way in keeping the mess under control — and she was right! 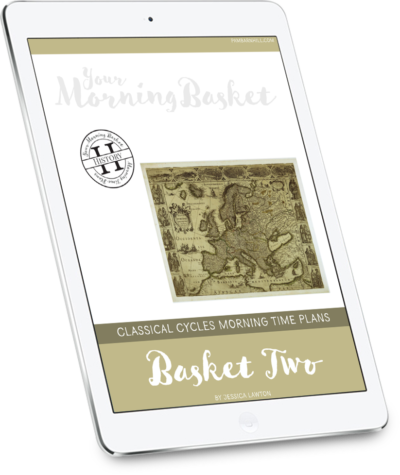 So right now you can get their entire bundle for 25% off (no coupon code required) or if you just want to try a few books those are 25% off as well. (The sale price does not show in the store, but when you add the item to your cart it is reflected — I tried it to be sure it works!) Hurry, though, this back-to-school sale won’t last long! 5 – What’cha reading? I am currently enjoying Written in My Own Heart’s Blood. I’ve been reading Outlander since the beginning and I have to see what happens next. I am also reading (skimming) a few different books for research on an upcoming blog series later this month. It’s going to be a fun one! 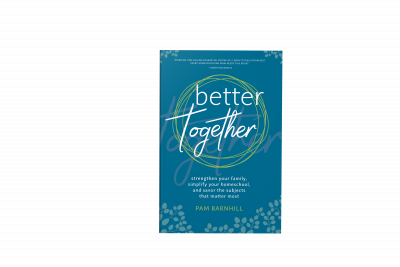 As a teaser, THIS is one of the books. 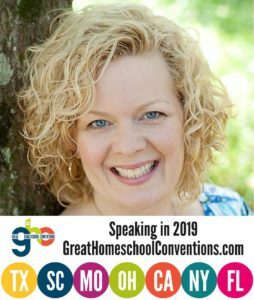 6 – Speaking of the Schoé Sisters, the other three gals have done an awesome series on homeschool scheduling this week AND they are giving away three copies of my book. If you hurry, there is still time to enter. I have loved all three of these posts! Back to the kids — Olivia is more than a little bit pug-obsessed and is dying to own one of her own — even to the point of volunteering to be on pooper scooper duty. John drives me crazy with all the rainbow loom bands he scatters about, but watching his skills grow with his craft has been fun to see. And Thomas learned to swim in the deep end a couple of weeks ago. That one doesn’t mess with my nerves at all (eye roll). Hope you guys have a great weekend. 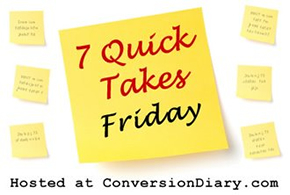 Check out more quick takes over at Jen’s place. I’m still not ready to to start school, but we are just going to have to start. If I spend another week getting ready things will come up and I won’t get it finished (just like the last two weeks). So, we are just going to go for it next week. It’s not going to be pretty! Some “stuff” has come up and we will have to take a day or two off already. It is completely my fault for not guarding my calendar! When I said yes, I thought it would be our second week of school. I’ve been looking hard over that schedule and looking forward to trying out some new scheduling plans. I’m sure I’ll blog about it if it works. If not, then you know it was a disaster! Our community pool has a diving board and I just couldn’t watch when my boys discovered it! Then I would notice the life guard wasn’t watching every time they jumped off, so I had to watch. We finally made the rule that no trying flips when mom is at the pool. My heart just couldn’t take it, lol! Can’t wait to read more about how all of it works out for you. The hardest thing about year round schooling is all the “stuff” available to do in the summer that is not any other time of year. Best of luck getting started!